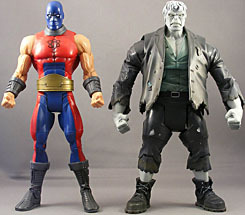 While there are plenty of extra-large villains for Mattel to choose from as Build-A-Figures, there are far fewer super-sized heroes. One of those few, though, is Atom Smasher. The godson of Al Pratt, the Golden Age Atom, Albert Rothstein acquired his mutant powers of super-strength and control over his molecular structure (allowing him to alter the size and density of his body) from his grandfather, a reluctant supervillain known as Cyclotron, allowing him to fight crime first as Nuklon, and then, later, as Atom-Smasher. Created in 1983 by Roy Thomas and Jerry Ordway, Atom Smasher gained popularity as a founding member of DC's current version of the Justice Society of America (as opposed to the Justice League). While the Justice League gets all the press and features high-profile heroes like Superman, Batman and Wonder Woman, the Justice Society has carved out its own niche in the DC Universe, as sort of a training ground and moral example for non-sidekick heroes. Atom Smasher comes in pieces with the other characters in DCU Series 7: Blue Beetle, Booster Gold, Big Barda, Captain Cold, and Kid Flash. (The Flash is also in the series, but he only comes with a display stand.) 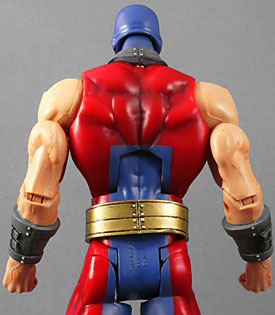 He's the first DCU "Collect and Connect" toy to be done in six pieces rather than five: all the others had the head and torso pre-assembled, but this time Mattel chose to milk the license spread the pieces out some more, so the head and crotch are now separate. Atom Smasher's design isn't complicated, but the Four Horsemen have done right by him. The most interesting parts of the sculpt are the boots, gauntlets, and head, which does a great job of capturing the look of a mask over real human features. He stands about 9" tall, towering looming over regular DCU figures and on par with the line's current tallest BAF, Solomon Grundy. Just don't try to compare him to any of Marvel's big guys - you'll be disappointed. The paint is solid work all around. The blue trim doesn't quite line up between the inside of Smasher's right hip, but other than that, I'm pleased with all of the paint work, particularly on the head and boots. 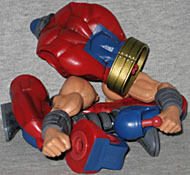 Atom Smasher has balljoints at the neck and shoulders; swivels at the biceps, wrists, waist, and lower thighs; and hinges at the elbows, knees, ankles and abdomen, with H-hinges at the hips to allow for a balljoint-like range of motion. The neck articulation is a little odd, and has a somewhat limited range of motion. Also, the ankles don't have any "rocker" motion, which unfortunately means his left foot can't stand flush against the floor. There are no real problems with the assembled Atom Smasher (for instance, the unusable joints on Metamorpho), though I understand some of the Blue Beetle or Booster Gold figures have been coming with the wrong Atom Smasher leg, but my figure is fine. 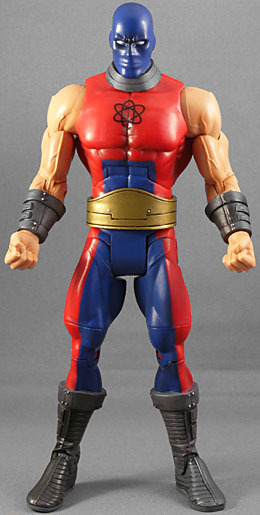 Ultimately, Atom Smasher is a rather average figure - he's really just a larger-than-usual basic DCU superhero figure. He doesn't have any of the unique body style or grotesqueness of a Solomon Grundy or a Kalibak. However, he's well-designed, and it's great just to finally have a large(ish) guy on the good guys' side. Plus, he'll look great with your growing JSA collection (which will triple with Series 8).